chronic, when the condition lasts for over three weeks. Insomnia affects all age groups and ethnicities. However, the incidence is more common among adult women than in the case of men. The chance of suffering from a sleep disorder increases with age. Those suffering from stress, anxiety, depression, alcoholism, drug dependency, mental disorders, and lack of adequate exercise have the greatest risk of suffering from insomnia. 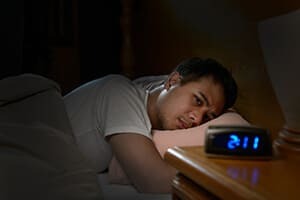 Because the symptoms of insomnia can be associated with numerous other conditions, Dr. Borenstein will conduct a thorough examination of to determine the existence of the condition and the type of insomnia. This will include asking about snoring, recent weight gain, lifestyle and sleeping habits, alcohol and recreational / prescription / over-the-counter drug use and examination of the sleeping habits of a bed partner. If a detailed medical history is available, this will assist in the diagnosis.